Ever since the advent of the web browser, B2B marketers have found that digital marketing is a much more efficient way to reach a targeted audience at key stages of their buyer journey; especially when they are actively seeking solutions. 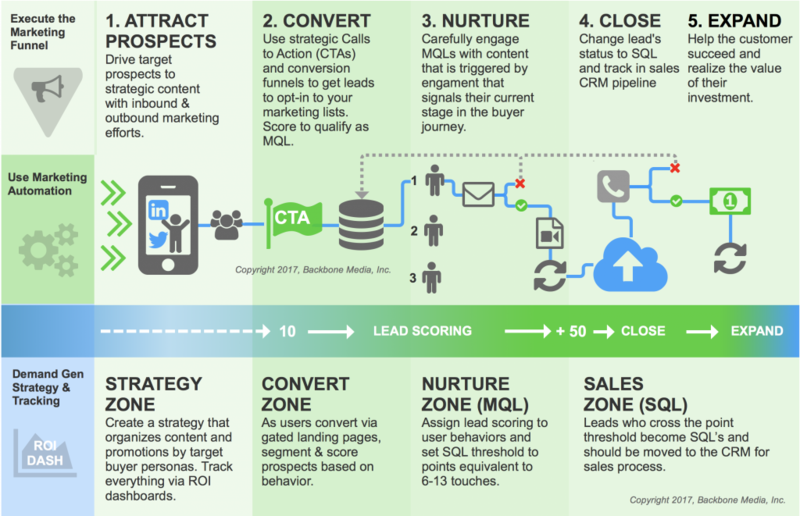 Here are the key stages of the typical buyer’s journey. For B2B companies, the priority goal is almost always to increase qualified leads. The following graphic illustrates the ideal of how marketers try to attract and nurture to the point where they are ready to be contacted and closed by sales. As you can see, there is clearly a lack of strategy and there are BIG gaps in-between the top of the funnel and the bottom of the funnel. The hottest leads are making it to sales, but warm leads are leaking out and additional resources are being spent to find new ones. Here are two statistics that highlight why this approach is ineffective and why lead nurturing is so important to the success of all your marketing efforts. At any given time, only 3% of your market is actively buying. 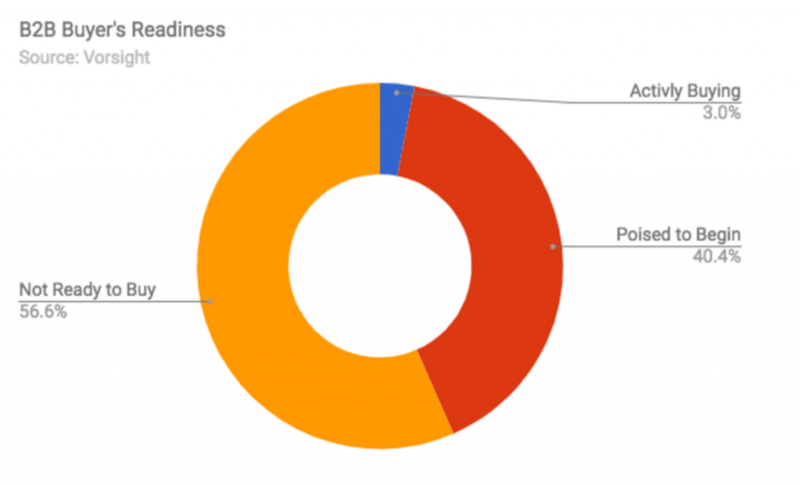 56% are not ready, 40% are poised to begin” [Source: Vorsight]. 63% of people requesting information on your company today will not purchase for at least three months – and 20% will take more than 12 months to buy. [Source: Marketing Donut]. 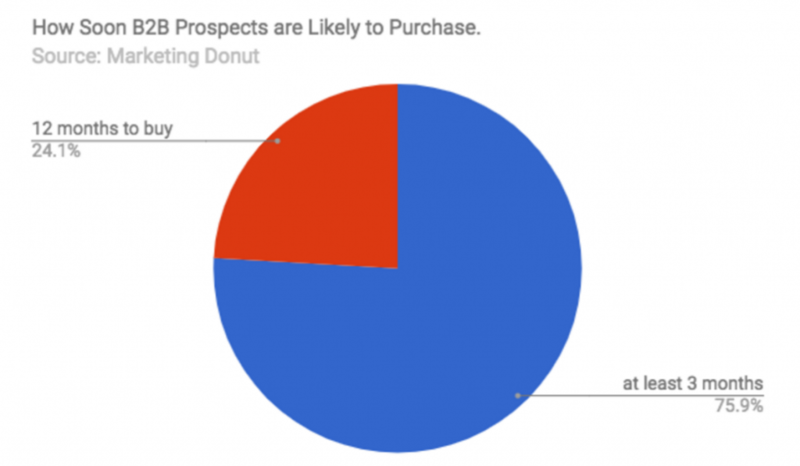 These two statistics support all the other studies that show that it takes 6-13 touches with a B2B prospect before they become a viable sales lead. This is why nurturing prospects is an absolutely crucial stage of the marketing funnel. Every qualified prospect is valuable and needs to be nurtured according to where they are in their unique buyer journey. So what this means in a strategic sense is that your marketing needs to quickly identify and engage the active buyers and nurture the others according to where they are in their buyer journey. This strategy ensures that good leads do not leak out, just because they are not ready to buy. Only 7% of marketers believe that they have achieved Inbound marketing nirvana so don't feel bad if yours isn’t there yet either. Nirvana happens when the marketer employs a strategy that aligns the marketing funnel with the buyer journey in such a way that the lead is always being engaged with the right content at the right time (stage in their buyer journey). To understand these gaps, marketers need to talk to actual customers and understand these Five Rings of Buyer Insight. Once a marketer knows the customer’s answers to these 5 rings of insight, she can identify the gaps and start to create a strategy that is focused on the most advantageous areas to place marketing resources. This how to maximize ROI and minimize leakage. Inbound marketing has evolved as an uber channel for reaching buyers, but it can be complicated to establish, manage and measure. The problem can be summed up in one word; fragmentation. It can easily get out of hand if you set out on a strategy with a meager budget, or lack of skilled resources dedicated to governance. A lot of the marketers that we work with inherited their mess, but it’s really easy to create your own too. 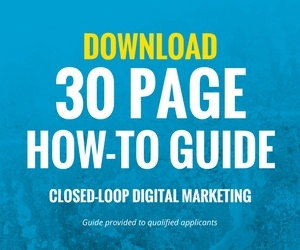 Move on to the next article to learn how Backbone Media’s closed-loop marketing solves this problem.